Rhubarb crumble muffins were a favourite of ours before little one was born. Packed with tart rhubarb, sugar, and a buttery, crumble topping; I haven’t made them in a while as they aren’t particularly allergy friendly. However, with rhubarb at half price in my local supermarket and a bag of free from porridge oats in our Sainsbury’s hamper, I thought it was time to make a little one friendly version! Plus, when possible I love to eat seasonally, especially when rhubarb season comes around. I find I enjoy baking and cooking with the seasonal produce even more than normal. As well as making the muffins allergy friendly for little one, I also wanted to make them a little healthier. They turned out just as yummy as I remember and it was great to know that little one could enjoy them with us too! It is another great recipe to get kids involved with. Little one loved helping to make the crumble topping and mixing the rhubarb in with the sugar. Unfortunately she wasn’t too keen on the rhubarb part of the rhubarb crumble muffins, but loved the crunchy topping! They are delicious served warm with cold custard and stewed rhubarb. Pre heat the oven to 220C and line a muffin tin with 12 cupcake cases. Set to one side. In a large bowl mix together the rhubarb and sugar. Place to the side whilst you make the crumble topping. In a different large mixing bowl, stir together the dry topping ingredients (sugar, flour, cinnamon and oats). 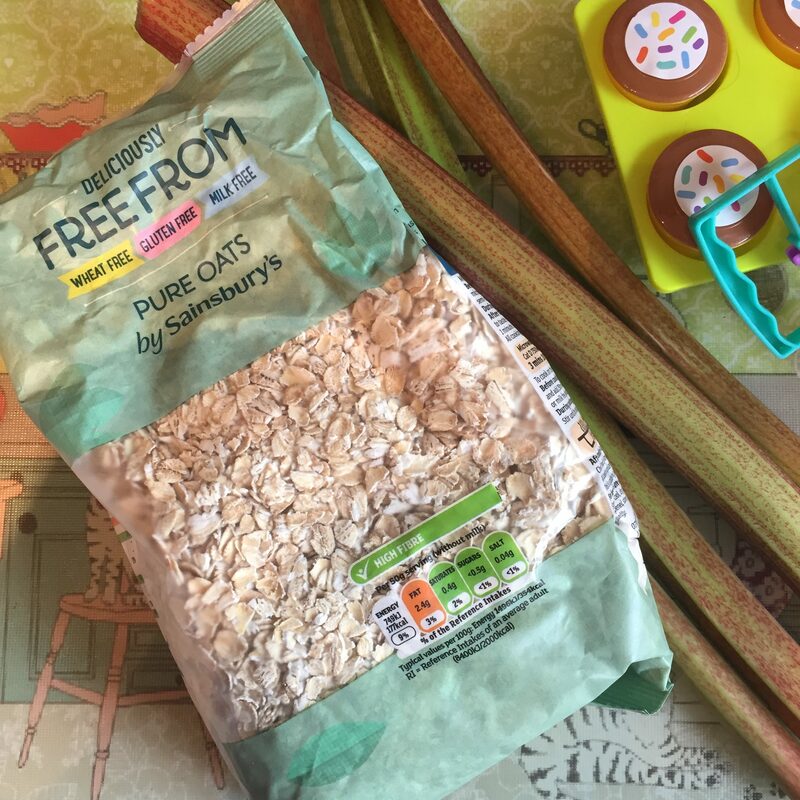 Then using your fingers rub the dairy free spread into the dry ingredients until you have a crumble mixture. Pop to the side whilst you make the muffin batter. To the rhubarb/sugar mixture add the oil, vegan egg, yoghurt, and vanilla. Stir until fully combined. Then sift in the flour, baking powder, and bicarbonate of soda. Stir again until mixed through. Evenly divide the batter between the 12 cupcake cases. Then sprinkle the crumble topping over the batter, pressing down gently to 'stick' it down. Pop the muffins into the oven to bake for 15-20 minutes. To check the muffins are cooked through, insert a skewer into the centre- it should be clean when removed. Leave to cool slightly in the tin before transferring to a wire rack to cool fully.